Strangles is a very contagious horse disease that is caused by the bacteria, Streptococcus equi. Unless you are vigilant, it can get out of control very quickly and cause problems for multiple equines. Luckily, good management and sharp observation of your horses are effective defenses against this horse illness. In this article, we discuss strangles and provide good information to help you keep your horse safe. Read on to learn more about strangles in horses, symptoms and treatment. 1 Is Strangles Always Fatal? 2 What Are The Symptoms Of Strangles? 4 How Long Can Strangles Bacteria Survive On Surfaces? 5 Is The Strangles Vaccination Effective? 6 Can A Horse Get Strangles Twice? 8 How Long Does Treatment Take? If left untreated, strangles can be fatal. 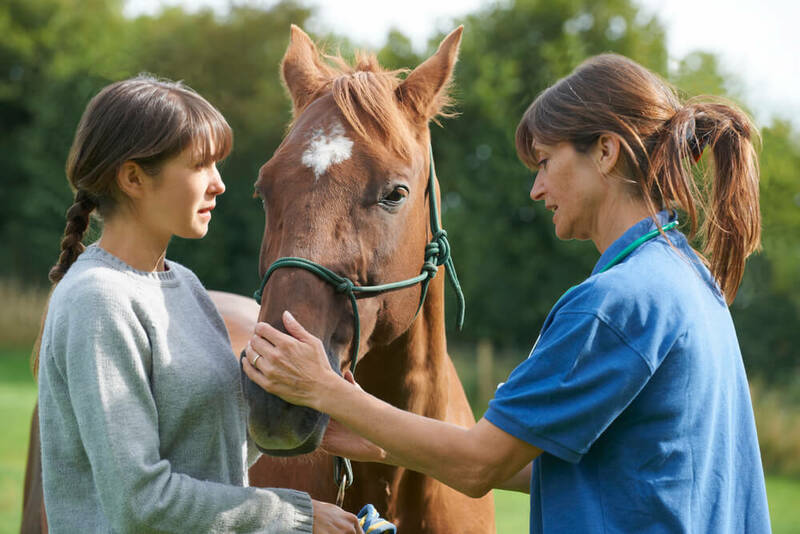 If you catch it early and work with your vet, the disease can usually be cured through use of quarantine and antibiotics within a couple of weeks. If you delay, complications such as pneumonia or a very serious condition called Purpura hemorrhagica may set in. Be advised that, even though treatment is possible for horses suffering from Purpura hemorrhagica, it is far less likely to be successful if the disease is allowed to become this advanced. Many horses who reach this advanced stage of strangles never recover completely. Euthanasia is often advised. This is one of the many reasons early detection of this illness is so important. The key to successful treatment and prevention of the spread of this disease lies in sharp observation and quick action. What Are The Symptoms Of Strangles? The very first sign of strangles is a high fever, but you may miss that. Strangles is a respiratory tract infection that starts in the nasal passages, so initial visible symptoms may seem like the symptoms of a common cold. If your horse gets a runny nose, be on notice and watch for signs of infection. The first visible sign is usually clear nasal discharge. This quickly worsens to become thick, whitish-yellow and pus-like. Soon the area around the jaw and jawbones will swell, and the lymph nodes will enlarge and become ball-shaped. Swelling may spread to the base of the ears. 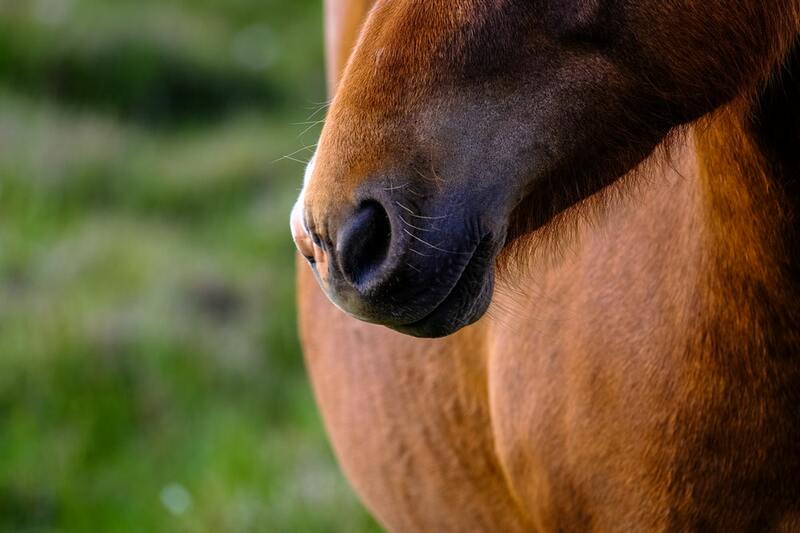 You may notice that your horse’s nostrils are inflamed, and if you can look in his mouth, you may see a red, inflamed throat. Your horse may become reluctant or even unable to swallow. 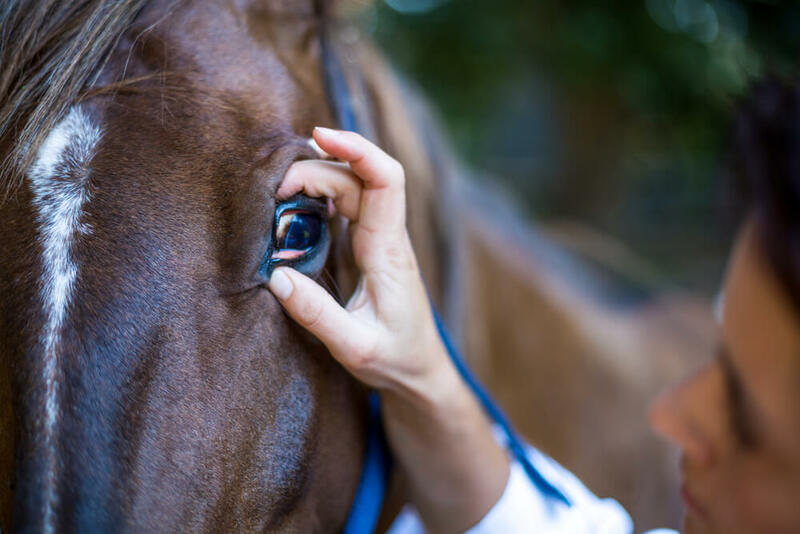 You may notice that your horse’s eyes are inflamed and red and may emit a yellow discharge. Many horses stop eating because of pain in the jaws and throat. Lack of food and painful symptoms inevitably lead to listlessness and depression. Check your horse’s lymph nodes to see if they are swollen. The lymph nodes are located under the jawbone at the top of the throat. Any time lymph nodes are swollen, it is a sign of infection and you should call your vet. If the lymph nodes become infected and go untreated, they can become abscessed and may interfere with breathing. When the lymph nodes become abscessed the area of the neck and head from the base of the ears along the base of the jawbone may become visibly swollen. Infected lymph nodes can quickly worsen and abscess. When this happens they eventually rupture and drain. 1. Plan ahead to be ready if a strangles outbreak does occur. Always have a quarantine plan in place. 2. Keep new horses entirely separate from others for a minimum of two weeks. During this time, take the new arrival’s temperature every day. 3. Keep your barn properly ventilated. Germs thrive in closed spaces. Having good air circulation can help prevent the spread of strangles. 4. Discuss strangles precautions before having your horse shipped commercially or sending your horse out for training, breeding or other activity. The entity who will be responsible for your horse’s welfare must have good hygiene practices and a solid quarantine plan in place. 5. Don’t allow your horse to touch noses with unfamiliar horses even if that horse seems perfectly well. Horses in the early stages of infection may show no signs yet may be shedding bacteria. Some horses who have had strangles in the past become chronic carriers. If bacteria sets up permanently in the guttural pouches, a horse may become a chronic carrier. This happens about 10% of the time and illustrates just how important it is to catch this disease early and treat it aggressively. A chronic carrier may show intermittent signs of illness or may show no signs at all. Careful management of your horse’s eating, drinking and socializing habits can go a long way toward preventing strangles. Avoid having your horse contract the disease by avoiding contact with unknown horses. Don’t allow your horse to drink from shared, public water troughs at equestrian events. Don’t allow him/her to eat from feed dish or trough that has been used by other horses. Don’t allow grazing in unfamiliar areas. How Long Can Strangles Bacteria Survive On Surfaces? It has long been thought that the Streptococcus equi bacteria can survive on surfaces for lengthy periods of time, but lab tests have shown that the bacterium can really only survive for a couple of months in a cold setting. In a warmer, open setting with a wide variety of other bacteria present (e.g. pastures and stalls) there is no evidence that this bacterium is especially long lived. Even so, it’s better to be safe than sorry. Always use clean individual feed and water dishes and avoid allowing your horse to come in contact with unfamiliar equines. Is The Strangles Vaccination Effective? There is an intramuscular vaccine that does help a horse’s immune system produce antibodies that circulate throughout the bloodstream. This can help lessen the severity of symptoms if the horse does become infected, but it will not prevent the horse from getting strangles because it does not affect the lining of the respiratory tract. Another downside of intramuscular vaccination is that circulating antibodies can actually lead to a greater risk of developing Purpura hemorrhagica. Furthermore, many horses experience severe, negative reactions at the vaccine site. For these reasons, intramuscular vaccination has fallen out of favor for general use. It is sometimes used in brood mares as the circulating antibodies are conveyed to foals through the mare’s milk, and this can be a very good thing. Today, most vets recommend use of the intranasal vaccine for at-risk horses. This vaccine contains modified live bacteria. The modification makes them less risky to introduce to your horse’s system. After vaccination, a horse usually develops a little clear nasal discharge. In some very rare instances, horses have actually contracted strangles from the vaccine. It is also possible for the intranasal vaccine to cause abscesses on any part of the body where there is a break in the skin – even a tiny hole in an injection site. For this reason, intranasal strangles vaccine should not be given along with injectable vaccines. Nor should this vaccine be used on a horse who has any open wounds. Horses who already have high levels of circulating antibodies against strangles (e.g. 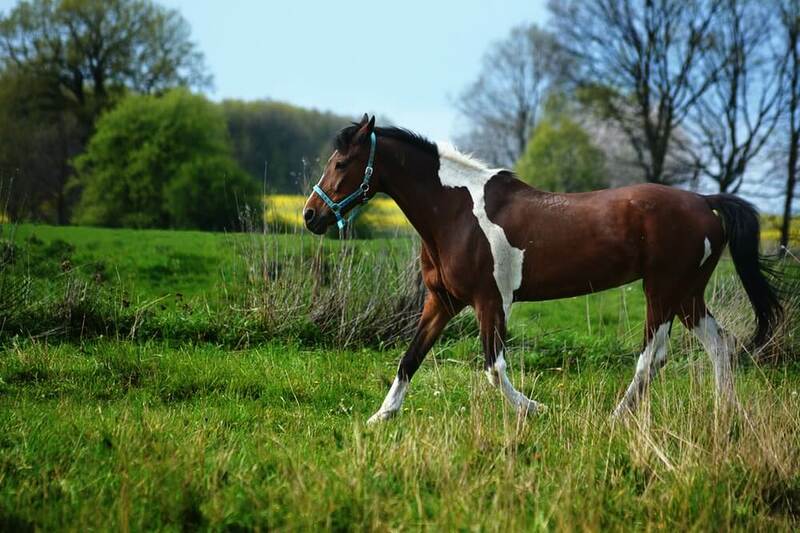 those who have received an intramuscular vaccination or young horses whose mothers received the intramuscular vaccination)are at greater risk for developing purpura hemorrhagica. Don’t vaccinate during a strangles outbreak. Don’t vaccinate animals that are ill in any way. Discuss your situation with your vet to determine whether it would be a good idea for your horse. Don’t vaccinate horses who have had or been exposed to strangles within the past two years without your vet’s go-ahead. Can A Horse Get Strangles Twice? Once a horse has had strangles and recovered fully, he or she may have built up some effective immunity against the disease. Factors that determine whether or not this is the case include the horse’s stress level, age and overall health. A mature, healthy, well-fed horse is more likely to develop solid immunity. 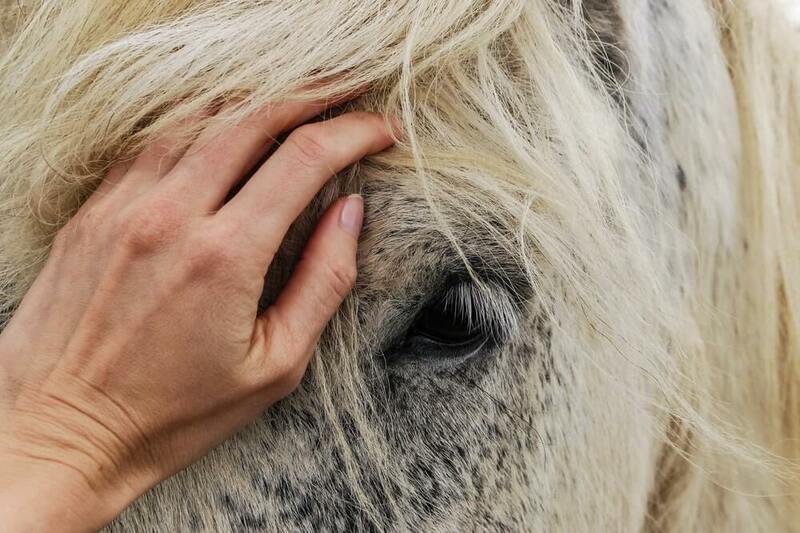 About 75% of horses who contract strangles do develop immunity, and this is said to last for about ten years. 1. Involve your vet from start to finish. Follow his or her advice closely and administer all prescribed medications carefully. Keep your horse well-fed and well-hydrated throughout the recovery period and beyond. 2. Because chewing and swallowing may be difficult, your horse may not have much appetite. Fresh grass is very nutritious and usually well-received. Remember that an infected horse must have a private grazing area with no other horses. If this is not possible, cut grass for your horse and deliver it to his stall. 3. Soaked hay may also be more appetizing to your horse and easier to swallow. Soak high quality hay or hay pellets or hay cubes in hot water for an easy-to-chew and swallow mash. 4. If your horse loses his appetite for grain, make a mash using pelleted feed. Beet pulp or rice bran can be added for roughage to help maintain good gut health during recovery. 5. Adding salt to the mash helps ensure that your horse will drink enough. A couple of tablespoons daily (divided among two or three feedings) should do the trick. 6. Observe your horse carefully to see if he seems comfortable with the level of his feed dish. Ground feeding may facilitate good drainage of abscesses and of the nasal passages, but swollen lymph nodes can make this uncomfortable. If your horse seems to experience pain while eating, try changing the level of his/her feeding dish. 7. Hot compresses may ease the pain of abscesses and help them drain. Soak a towel in a solution of Epsom salts and very warm water. Wring it out and hold it against abscesses for ten or fifteen minutes at a time, several times daily. 8. Keep your horse’s runny nose clean by wiping it with a clean cloth dipped in warm water several times daily. Use a mentholated petroleum jelly product (e.g. Vicks or Mentholatum) to help prevent chapping and ease breathing. 9. Be sure to wear disposable plastic gloves when tending your horse. Use clean gloves each time, remove them carefully and seal them up in a plastic bag for disposal in a properly marked “hazmat” waste container. 10. Naturally, your quarantine area should provide proper protection from the elements and room to move about comfortably. 11. Your horse’s head and neck may swell up unexpectedly, so don’t leave a halter on. 13. If purpura leads to laminitis, you should pay close attention to hoof care, in addition to veterinary care. Keeping your horse’s hooves properly trimmed as he recovers will help prevent permanent crippling. If caught in the early stages, before abscesses develop, a ten day course of antibiotics will usually do the trick. This is why it is so important to be extremely familiar with your horse’s normal behavior and appearance. This knowledge allows you to act quickly when things begin to go awry. More advanced cases of strangles require at least a fourteen day course of antibiotics. This varies depending on just how advanced the spread of the disease is. In addition to antibiotics, some invasive treatment may be necessary. For example, if the guttural pouches are infected, they may need to be flushed. If chondroids (hardened, bacteria laden mucus stones) have developed in the sacs, surgical removal may be necessary. If purpura hemorrhagica develops, your horse will need a combination of antibiotics and corticosteroids. Treatment could take a very long time and may not be successful. It’s easy to see that avoiding strangles should be a top priority for any horse owner. Luckily, common sense precautions, consistent horse care and sharp observation are the best defenses against this illness, and they are all absolutely free.